January was an outstanding success, and eyes turn to February. The ramp up to Nomads went as near-to-plan as anyone could hope (-1B short, but on schedule) and the first is queued to come off the line around the 24th. 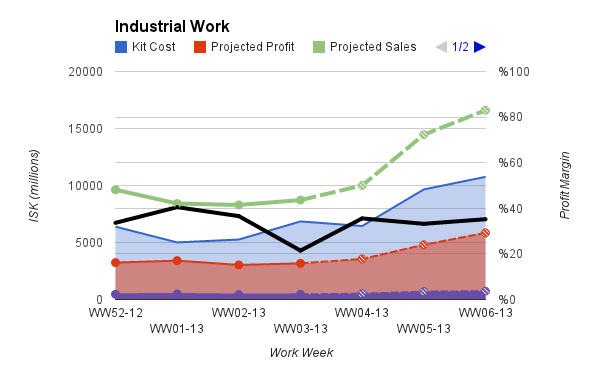 Also, as the Accounting Sheet shows, all but the most recent week have been outstanding. The only bad bet of January was Phobos after the Asakai fight. February is going to be a cash stockpiling month. With the shortened month, I can only do 3 work weeks. Also, with the extra-long build times on Nomads, I will need to stock the ISK for a second one before the first comes off the line. Also, I would like to get the BPOs to be able to do black ops. Even though the market should significantly cool from the speculation over the proposed black ops changes. Black ops have had healthy margins for a long time, and the barriers to entry should keep the margins healthy enough to justify 10-15/month. The primary goal for Prosper is to deploy the foundational database. Progress is going well for processing the eve-central raw dumps, and I hope to start some of the fancier work in February. I don't expect to hit all the goals (Normalizer + Toaster is the more reasonable goal). Trying to knock out the hard parts first, since they don't exist yet. Industry data should be reasonably easy to parse in once the DB is built and seeded. There are some really interesting things happening in the numbers I am watching. First, that the player surge from Retribution is providing a lot more business and competition. I believe the numbers are growing faster for competitors than new buyers, but I have no way to track that. My method up to now has been "Guns and Bullets". While ammo continues to preform inside acceptable margins, the ground is shrinking quickly around guns. Lasers still are peak performers but I start to worry as margins dry up on blasters. It smells like blasters are a popping bubble... here's to hopes of a rubber-band. Also, this shrinkage has prompted me to diversify more... which is good for the whole system. As I add new products to my rotation, I stockpile that many more BPCs into the vaults for future pouncing. With February's theme being "stockpile", this is a good trend. T2 ships are also a quickly shrinking subset. January had a lot of healthy margins across ships that serve unique purposes (recons, hictors) and popular FOTM's (Zealots... oh god the zealots). But tiericide has pushed a whole lot of ships into the obsolete pile. This is causing the margins to thin out, and the "good" products are thinning too. My long-bet is as summer rolls around, T2 ships are going to be hit very hard by "the summer doldurms". Without news about T2's rebalance and plans for tiericide, I think ship production is going to be a bumpy ride for all of 2013.